A complex deity, Ishtar combined the characteristics—both good and evil—of many different goddesses. As a benevolent mother figure, she was considered the mother of gods and humans, as well as the creator of all earthly blessings. In this role, she grieved over human sorrows and served as a protector of marriage and motherhood. 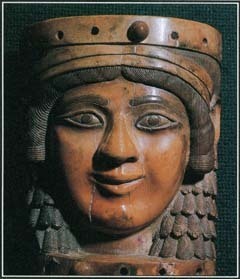 People also worshiped Ishtar as the goddess of sexual love and fertility. The evil side of Ishtar's nature emerged primarily in connection with war and storms. As a warrior goddess, she could make even the gods tremble in fear. As a storm goddess, she could bring rain and thunder. Some myths say that Ishtar was the daughter of the moon god Sin and sister of the sun god Shamash. Others mention the sky god Anu, the moon god Nanna, the water god Ea, or the god Enlil, lord of the earth and the air, as her father. Most myths link her to the planet Venus. Ishtar was worshiped as both a good and evil goddess by the people of the ancient Near East. They honored her as the protector of marriage and motherhood as well as a warrior and storm goddess. impressed by his courage and exploits. According to the epic, Gilgamesh refused her offer and insulted Ishtar, reminding the goddess of all the previous lovers she had harmed. Enraged, Ishtar sent the fierce Bull of Heaven to kill Gilgamesh, but he and his friend Enkidu killed the beast instead. The other well-known myth of Ishtar concerns her descent to the underworld and sacrifice of her husband Tammuz (also known as Dumuzi). In this story, Ishtar decided to visit the underworld, which was ruled by her sister Ereshkigal, perhaps to seize power there. Before departing, she instructed her follower Ninshubur to seek the help of the gods if she did not return. To reach the underworld, Ishtar had to pass through seven gates and remove a symbol of her power—such as an article of clothing or a piece of jewelry—at each one. At the last gate, the goddess, naked and deprived of all her powers, met her sister Ereshkigal, who announced that Ishtar must die. She died immediately, and her corpse was hung on a stake. Meanwhile, the god Enki learned from Ninshubur that Ishtar was missing and sent two messengers who restored her to life. However, in order to leave the underworld, Ishtar had to substitute another body for her own. The goddess offered her young husband, Tammuz, to take her place. This tale of death and rebirth was associated with fertility and linked to the seasons and agricultural cycles, much like the story of Persephone in Greek mythology. Temples to Ishtar were built throughout the ancient Near East. Among the most famous were those at the cities of Erech, Babylon, Ur, and Nineveh. Her cult was very popular and may have included rituals associated with sexual love. See also Anu ; Enlil ; Gilgamesh ; Inanna ; Semitic Mythology ; Shamash ; Underworld .